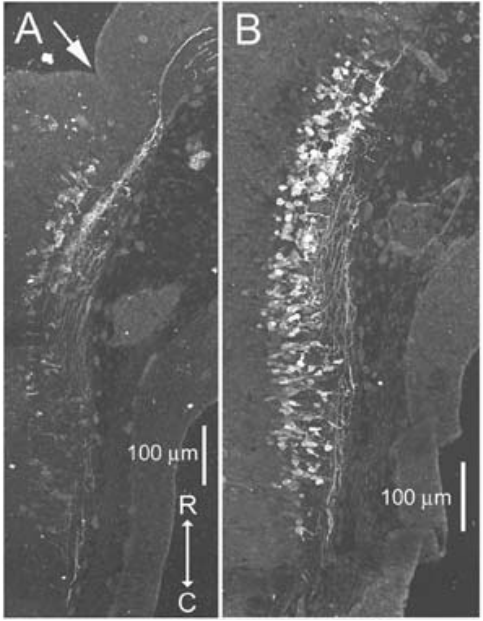 Immunohistochemical identification of serotonergic neurons in hindbrain - sagittal and parasagittal sections. Hunt et al., 2005. Immunohistochemical label of Cav3.3 in sagittal section of chick hindbrain (E6). Hughes et al., 2009. Dextran-identified trigeminal motor neurons, exit point to the periphery is in lower left corner. E11.5 hindbrain. Propagation of event from InZ (top of imaged region). Midline is placed diagonally across imaged region. Red signal is high intracellular calcium; arrow indicates weaker laterally-propagating wave. Hunt et al., 2006a. Transverse section of hindbrain labeled with antibody against 5HT2A receptor (green); dextran-identified trigeminal motor neurons in red. Midline shown by vertical yellow line. E11.5. Hunt et al., 2005. Transverse section through E11.5 hindbrain with antibody label for serotonin (5HT). 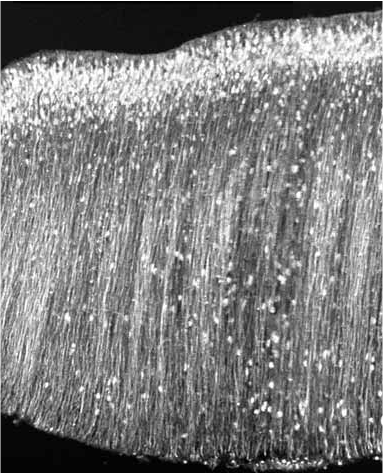 Newly differentiated neurons are migrating out of the ventricular zone, sending axons across the ventral commissure. Scale bar 50 um. Hunt et al., 2005. Immunohistochemistry for KNCK9 K channel, showing expression in lateral, but not medial regions. E11.5. Courtesy of Kelly Duong.